I have a confession to make. Every year during the holidays, I spend at least a day or two trying to create a bow. You know, not the "bunny ears an thru the hole" bow that you tie your shoe laces with, I've gotten that one down pat. But a gift bow. Pretty, beautiful bows you put on presents with big fat loops. And every year I'm defeated, no matter how many tutorials I read or watch, or how many books I pick up at the library. What does this mean? It means that this just isn't one of my talents. I'm not going to give up, but well, I've come to the conclusion that I just might never succeed. You know who I bet makes absolutely -gorgeous- bows, though? 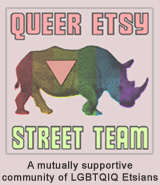 The artist behind Kiss a Design on Etsy! I just take a look at the picture in this post if you don't believe me. 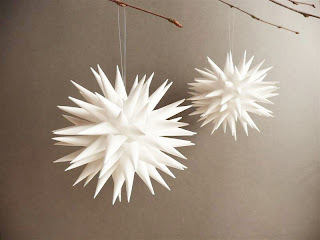 These beautiful Star Urchin ornaments are made of paper and she has them in a wonderful variety of colors. The Star Urchins are her modern adaptation of a traditional Polish porcupine ornament, and each one is completely by hand and has 80 hand-formed points. Her family has been making them for over half a century and, as you can see, many years of practice now produces a very neat and aesthetically appealing ornament that's both delicate and celestial. Can you just imagine the amount of patience and time that it takes to make one? YOU CAN CLICK ON THE PICTURE ABOVE TO VISIT KISSADESIGN'S SHOP OR, IF YOU PREFER, CLICK RIGHT HERE. I'm a New Fan of... Mushrooms!